In Rockstar Presentations, author Joseph Lewis shares tips, tricks and wisdom on public speaking with no fear, no cue cards and no worries! Whether you’re giving a blockbuster keynote or teaching a handful of co-workers how to do something cool, this book was written for you. This book also comes bundled with 3 great PowerPoint templates you can use in your own presentations. You can view the first pages of the book including the contents and some sample pages via Lulu Book Preview. In your company meeting room, in an auditorium, in front of a PowerPoint presentation or at your own keynote address, the skill of presenting allows you to be a thought-leader. There is no more powerful way to communicate your ideas than through a great presentation. To take your career or your personal brand to the next level, giving presentations is a must. But most people fall into one of two camps – they’re afraid of presenting, or they don’t know how to do it well. 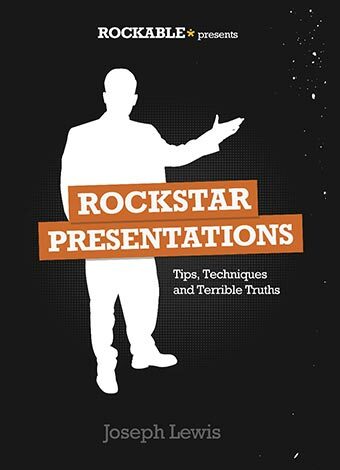 Rockstar Presentations was written to transform every reader into a fearless, talented presenter. The tips and techniques in the book can be effectively applied by anyone – beginners and veteran speakers alike. How good would it feel to give a talk on your ideas, to feel great about it, and to be met with heartfelt applause at the end? With years of experience giving talks to bosses, peers, clients and students, Joseph Lewis can teach you to be a Rockstar Presenter. Do You Get Nervous When Asked to Present? Public speaking is one of the world’s most common phobias. If you speak at a hundred miles an hour, if your hands shake, if you feel nauseous when presenting, you’re in the grip of that fear. How is it that great presenters seem so cool, calm and collected on stage? Is it because they don’t get nervous? Not at all. Even the world’s greatest performers get nervous, but they’re are able to hide their nerves by using simple, time-tested strategies for avoiding stage fright. Forget everything you’ve heard about imagining your audience in their underwear. If you were nervous before, that won’t help! Instead, Joseph Lewis shares clever and non-intuitive tips for staying calm and in control during your presentations. With enough practice, you’ll start to enjoy yourself, crack jokes, and bond with your audience. Here you’ll find exactly what’s covered in the book, chapter by chapter. Chances are there’s a chapter especially for you! Learn what made The Gettysburg Address and Churchill’s “We Shall Fight…” speeches so good, and the simple tips you can learn from them. This chapter establishes the essentials of a good presentation. You’ll learn how to prepare and how to practice your presentation for a seamless delivery. When the time comes to give your talk, Joseph’s tips will help you avoid stage fright and deliver an exciting presentation. Moving up at work will probably require you to give presentations to your colleagues. They’re an opportunity to influence the direction of your company – or your clients – and make a great impression if done well. The huge influence of people like Steve Jobs and Randy Pausch (‘The Last Lecture’) began with their stunning keynote addresses. Learn what makes their talks so effective. You have the opportunity to give a keynote address. This chapter will show you how to embrace this incredible opportunity, wow your audience, and spread your big ideas. Pitching your ideas – or your product – to a room is a nerve-wracking experience. You need to bring your A-game because you may only get one chance at success. In this chapter you’ll learn that a good pitch stands on three legs, and the trick to a good pitch. A warning on the risks of failing to communicate information properly, focusing on the fascinating story of the Space Shuttle Challenger and Space Shuttle Columbia disasters. Teaching others is one of the biggest responsibilities we can undertake. If you’re ever given the opportunity to teach, this chapter will give you fundamental tips on how to succeed and leave a lasting impression on your students. In this special bonus chapter you’ll learn the PowerPoint pitfalls to avoid – from fancy footers, to washed out watermarks, to adding too much text. Joseph gives you five simple rules to follow instead. Bonus: Get 3 Great PowerPoint Templates Worth the Cover Price! Three top-selling PowerPoint layouts included with the book will make sure you’re never scrambling to put a layout together again. Everything you need to know about giving great presentations – with bonuses worth the cover price!